By Aileen Thomson, ICTJ Program Coordinator. Former head of ICTJ's Myanmar office. 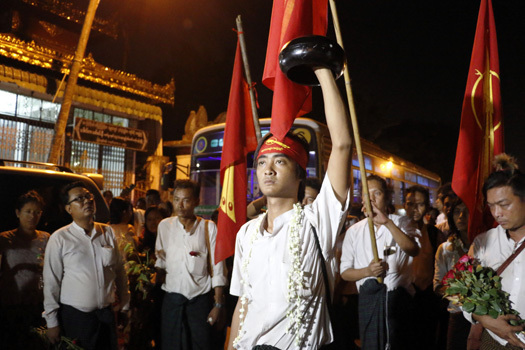 For many years, the Assistance Association for Political Prisoners (AAPP) has collected documentation about political prisoners in Myanmar, monitored their status and advocated for their release. It’s also supported them after their release, providing services from mental health counseling to vocational training to small loans. In order to provide more effective support and to advocate for the government to fulfill its obligations to provide such support, AAPP embarked on a research project aiming to comprehensively document the experiences of political prisoners in Myanmar. It sought to catalogue the activities that led to their arrest, the conditions of their detention, the challenges they face on their release and more. In May 2016, AARP released a report on the results of this research, which included recommendations to the government to provide reparations to former political prisoners and to establish a truth commission that allows their experiences to be known and recognized. ICTJ has supported AAPP's work over the past 3 years by providing technical assistance in the preliminary stages of their research and by providing capacity-building and technical assistance in the development of reparations proposals. The political environment in which AAPP released their report is in many ways fundamentally different from that in which they started this research. During the lifespan of the project, a new government was elected and took office, led by Aung San Suu Kyi, herself a former political prisoner who spent many years behind bars and under house arrest for her political activities. An estimated 124 Members of Parliament are also former political prisoners, as is the new president Htin Kyaw. However, in many ways the situation former political prisoners face has not changed. The military still controls the police force and the corrections system. There have already been new political prisoners arrested under the new government, detained for peacefully protesting and for criticizing the military on social media. AAPP and others who work closely on these issues believe that there will still be political prisoners until the 2008 Constitution is amended to place the police and corrections system under civilian control. In this environment, it may seem premature to talk of remedies for political imprisonment. However, the urgent needs of former political prisoners have spurred AAPP to pursue reparations at the same time that they work to release the current political prisoners and prevent the arrest of more. Aileen Thomson, formerly ICTJ's lead expert in Myanmar, recently sat down with Tate Naing, Secretary of AAPP, to discuss the research and how it fits into the current political situation. National reconciliation is a very popular topic right now in Myanmar, and some people say we must not discuss what happened in the past so that we can have national reconciliation. However, I know AAPP has always said there can be no national reconciliation while there are political prisoners. Could you explain that a bit? How are national reconciliation and political prisoners related? Yes, our motto is that there can be no national reconciliation as long as there are political prisoners. Most political prisoners were arrested because of their work related to national reconciliation, and many are from ethnic minorities, so these issues are closely related. When we talk about national reconciliation, it is directly related to truth and justice. We need to see truth as a first step toward reconciliation. The second step is to give reparation to victims. We must give reparations to the former political prisoners who were tortured and physically violated. We also need to try to clear out the hate and revenge from victims' minds. Once we can do that, they can better contribute to national reconciliation. Most political prisoners were actively trying to achieve national reconciliation, democracy and human rights, and that is why they were imprisoned. So for sure, after their release, they will still continue to struggle for these goals. For example, those who were involved in the 1988 protests were imprisoned for around 20 years, and as soon as they were released they started talking about national reconciliation as a starting point for their future activities. From AAPP's experience, most political prisoners are still very actively working toward their goals of national reconciliation, democracy and human rights. AAPP has been collecting information about political prisoners for a long time, but this is the most systematic research you have done. Can you tell me a little about the background of the report? Why did you decide to conduct this research? First, we wanted to have a historic record of political prisoners and to collect a list of their names in order to acknowledge their suffering. Many countries have this kind of list, but in Myanmar we have no systematic, complete list, so that is why we chose to start this research. The second aim of the project was to promote networking among former political prisoners. When they are released, many of them are struggling individually. We don't want to see them struggle like that. We want to make a network, a connection between one to another –that way they can help each other. Thirdly, we wanted to ask them about their experiences to help cure their minds and rehabilitate their lives, in order to get truth and justice. Was there anything in the results of the research that was surprising? There was a lot that was surprising. One example is the number of political prisoners we were able to document. We thought that we could document from 7,000 to 10,000, but we were only able to collect information from over 3,000. There are many reasons for this. Some people moved abroad; some want to keep a low profile; others don't want to talk about the past because it is painful. Some people are working with local authorities, maybe in business or other work, so they don't want to speak out. There are still divisions between different groups, so some people did not want to talk to us for those reasons, or because they did not trust us. In addition to the lower-than-expected numbers, what challenges did you face when collecting the information? The main thing was finding the political prisoners. It was very complex. There are so many areas, and we needed to spend a lot of time to find many people. Sometimes they live in remote areas, far outside of a village, so we had to spend a lot of time and money doing fieldwork to find them. Another challenge was that we had to do a lot of follow-up to fill gaps and confirm information. We had two, three versions of each statement. The survey form didn't always ask the right questions, so sometimes we had to follow up later to fill in gaps. And even among organizations who are still working actively, they didn't always fill out the whole form like we asked them to, and they were too busy for an interview. Speaking of remote areas, I know that many of the most remote areas are populated mostly with people from ethnic minority groups. These areas can be hard to access because of conflict, transportation, trust and language, among other barriers. Were you able to get good access to ethnic minority areas, or do you think you missed many political prisoners from ethnic minorities? We missed a lot, especially from ethnic minority areas. Even in the urban areas we still missed people, and it was much harder in ethnic areas. Despite the challenges you faced, you managed to complete quite an in-depth, detailed report. What do you hope to accomplish from this report? What do you want the government to do in response to the challenges you have identified? In publishing this report, we wanted to tell the government what they can do to support the victim communities. For instance, the government can amend the unjust parts of the constitution and undemocratic laws, and pass laws to better protect human rights. We also want the government to start a reparations process for the victims. This can start by creating memorials and acknowledging victims and important events. But they must do more than just acknowledge. The government should accept that they have done so many things to these people who believe in their political rights. At the least, they need to apologize to those people who want to hear their confession. We want the government to know that in other countries, after the release of political prisoners, they have implemented some rehabilitation programs for the former political prisoners and their families. For example, they may have some programs to provide jobs for political prisoners. We don't see that done by the government in Myanmar yet, so we want to see that happen here. The last expectation is to compensate victims in some way. There are different forms of compensation: it can be material or moral compensation, but there should be compensation for the victims. It sounds like you have made many recommendations to the government, some of which may be more contentious than others. What has been the response from government so far? We haven't gotten any response from the current government. However we will do more advocacy. In terms of government outreach, we are trying work with the former political prisoners who we know who are now members of parliament to negotiate with different committees in the parliament. We are especially targeting the Democracy, Human Rights and Citizen Rights Committee formed in the Lower House. We want to make sure that they listen to our voice. We have already had some success in discussing our opinion about the Peaceful Assembly Law with some MPs from the Upper House, so we hope we can continue our engagement with Parliament. Right now, the situation is tense and the NLD-led government is trying to balance its relationship with the military. Many people have said that addressing past violations is not a top priority, and worry that bringing up these issues will damage relations with the military. In the current situation, what do you expect the current government will do? Which of your recommendations do you think they will be most willing to implement? The first thing is we expect they will amend the undemocratic laws, so we are targeting that issue through direct advocacy. Secondly, we have written a concept paper to the Myanmar National Human Rights Commission to press them to make recommendations about prison reform, and we will hopefully talk with them at the end of the month. That is what we expect will succeed in the short term. Finally, what is the most important thing from the experience of this report that you want to tell international readers? We hope that people reading this can advocate to their governments to have sympathy for the current and former political prisoners in Myanmar and make them understand that they are suffering and still need assistance. Then hopefully those governments can find a way to protect and assist those political prisoners in different areas of Myanmar – in cooperation with the Myanmar government or by themselves.